United States, Early 1960s Jens Risom designed this distinctive walnut side table with a raised gallery on three sides, a single suspended drawer and a low shelf covered in black leather. A rarely seen piece with great charm. 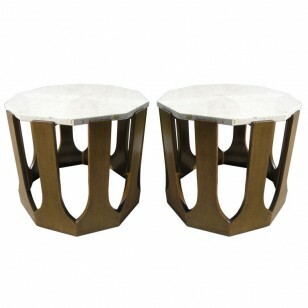 Italy, 1970s These small side tables feature beveled edges. USA, 1950s This side table, model 5425, was designed by Edward Wormley for Dunbar. 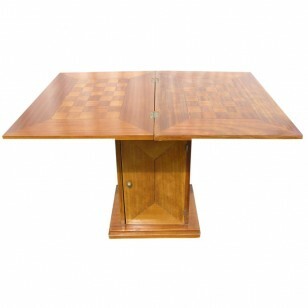 It features a slat mahogany base with the original glass top. Unknown, 20th Century This side table is in the style of Giacometti and constructed of hand-hammered iron. It features tapered legs, an X-frame stretcher, and a smoked glass top. USA, 1950s This rare occasional table, which was designed in 1957 by Edward Wormley for Dunbar, is constructed of walnut and features three gently curved legs and round top with four inlaid tiles by Gertrud and Otto Natzler. USA, 1957 This rare occasional table, which was designed in 1957 by Edward Wormley for Dunbar, is constructed of mahogany and features three gently curved legs and round top. USA, 1950s Designed by Paul McCobb for Directional, this end table is composed of a rectangular travertine top and a brass base. A corresponding sectional sofa with travertine corner table is also available. USA, 1950s This small end or side table by Paul McCobb is composed of a white formica top on a brass base. USA, 1950s T. H. Robsjohn-Gibbings designed this set of three richly grained mahogany nesting tables for Widdicomb. The rounded frame of each table top extends seamlessly into the tapered legs. The small table measures 16 in. W x 23.5 in. USA, 1950s This small table by T.H. Robsjohn-Gibbings for Widdicomb features a triangular top with curved corners that sits atop three flared legs. USA, 1960s This end table by John Widdicomb features a cane shelf, one shallower drawer, and stunning walnut grain. USA, 1950s This pair of handsome midcentury end tables, in the style of Bertha Schaefer, features a stepped two-tiered ebonized wood frame with a warm travertine inset. USA, 1950′s This pair of side tables features cork tops which are perfect or beverages. The small size makes them a convenient addition to any space. Denmark, early 1960s Designed by Hans Wegner for Getama, this side table features a grid of green ceramic tiles set into an oak frame, perfect for a sun room. USA, 1970′s These beautiful side tables by Karl Springer are constructed of 1″ thick crystal glass attached to a solid steel column which is covered by a brass plated sleeve. Signed at the base and labeled on the interior post. 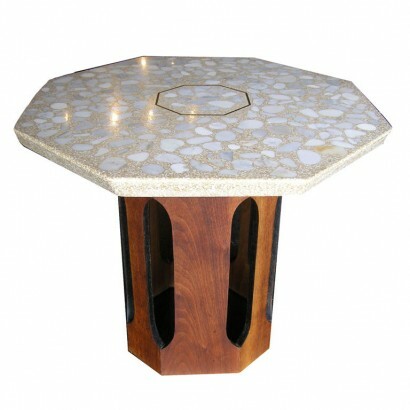 USA, 1950′s This beautiful side table has a unique travertine composite top with marble inlays. USA, 1950′s Pair of matching side tables by Harvey Probber featuring removable travertine tops on a decagonal mahogany base.